Knife maker Steve Pellegrino checks to make sure one of his blades is cut out for the next step in the knife-making process. Meet Steve Pellegrino, bladesmith and owner of Pellegrino Cutlery. A cut above: "I like to design knives that look like sports cars. I feel it's almost completely unnecessary in the same way a Lamborghini is unnecessary. It does what it does very well and, some will argue, looks good doing it." Aesthetics and kinetics: "Some of my favorite things to make are where art and science are combined. Cooking is certainly one, bladesmithing is another." When bladesmith Steve Pellegrino began making knives three years ago, they couldn't cut the mustard. "They looked like hamburgers," he said. "They were terrible." But something about failing was addicting to Pellegrino. Each time he blundered another blade, he became more determined to succeed. "I really think I just failed miserably, and it got me interested," he said. "I wanted to learn why it didn't work and how I could possibly make it better." Steve Pellegrino steels himself before his next knife-making project. Today, Pellegrino, 28, of North Philly, not only owns his own custom-knife making business, Pellegrino Cutlery, he also documents his process on Instagram for thousands of followers. The videos in which he tests his knives on tomatoes, water bottles, and everything in between are particularly, and inexplicably, satisfying to watch. Pellegrino's social media presence is one of the few digital aspects of his knife making, a craft that dates back to prehistoric man. In 2005, Forbes named the knife "the most important tool of all time." All of Pellegrino's knives start as freehand sketches, inspired by the shapes and patterns he sees in the world around him. Primarily self-taught, he uses high-carbon and stainless steels for his blades, and wood, micarta, carbon fiber, and other materials for the handles. This blade made by Steve Pellegrino is on point. Once the design and materials are ready, Pellegrino drives more than an hour to Upper Black Eddy, Bucks County, where he works in a small garage built by his grandfather on a property that's been in his family for three generations. Sometimes a cow will stop by while he's working — he's named her Bessie — but the only other interruptions come from the propeller sounds of small planes towing and releasing gliders up above. An old light-up "Hardware" sign he picked up from Jinxed in West Philly hangs in the back corner of his garage, and a grinder and kiln are on either side in the middle. Clear Rubbermaid containers full of tools and first-aid kits line the shelves, and phone numbers written in pencil by his grandfather remain on the fuse-box door, next to a rotary phone that no longer works. Bladesmith Steve Pellegrino gets a handle on one of his creations at his workshop in Upper Black Eddy. 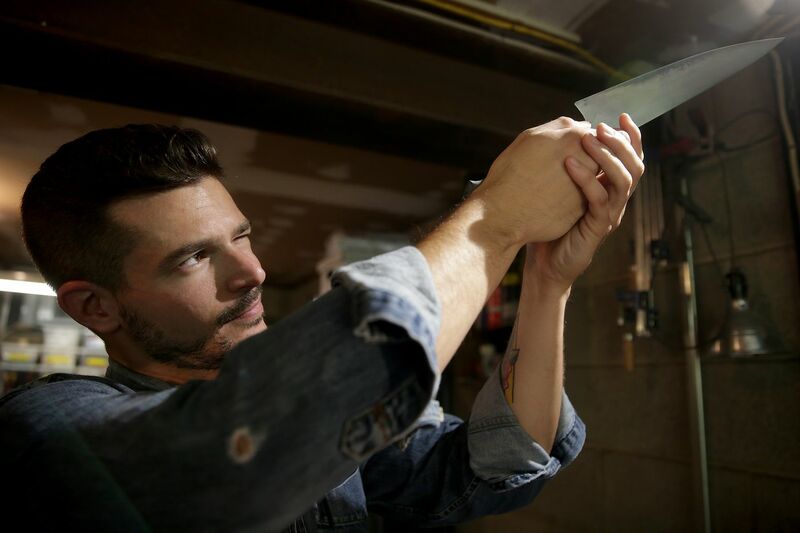 Pellegrino, a native of Flemington, N.J., never imagined he'd be making knives here — or anywhere — when he graduated from the School of Visual Arts in New York City with a degree in graphic design. Following graduation, he opened a shop and built custom props and sets before moving to Portland, Ore., where he got an apprenticeship with a straight-razor company. There he learned to make blades by hand, sharpening them on Japanese water stones — a technique he still uses today. His obsession with blades had begun, and when he moved to Philly three years ago he started his own business and never looked back. Pellegrino's knives are Japanese-inspired culinary blades with his own twist, and are made to be used by professional chefs and home cooks. Pellegrino, who also loves to cook, used to make hunting and pocket knives, too, but has phased those out. "I'm not a hunter, so if I created a hunting knife, I wouldn't really know or confidently stand behind what it could do, because I don't have a reasonable application for it," he said. "With culinary knives, I can immediately go cut a potato and learn what I liked about it and what I didn't." Making knives can be a grind, as bladesmith Steve Pellegrino demonstrates here. At any given time, Pellegrino is working on five to 20 knives in various stages. When complete, the blades usually sell for between $300 and $1,000 each. "I've had plenty of people tell me my knives are overpriced, and I always joke with them that I can't afford my knives either," he said. "Luckily, I don't have to." National and international customers — many with custom orders — typically find Pellegrino through his Instagram page or website, since his products are not on store shelves. Pellegrino is making knives for Dominic Piperno, chef and co-owner of Hearthside in Collingswood, and he'd love to see his work in the hands of other famous chefs like Marc Vetri, Michael Solomonov, and Matty Matheson. Someday, he'd like to find a workshop in the city, too. But for now, Pellegrino is happy honing his craft — and his blades — in his workshop in Bucks County, with the occasional visit from Bessie the cow. Know someone in the Philadelphia area whose story deserves to be told — or someone whose story you’d like to know? Send suggestions for We the People profiles to Stephanie Farr at farrs@phillynews.com or call her at 215-854-4225. Send tips via Twitter to @FarFarrAway. Want more We the People? As a kid, Shelley McDonnough grew up on Tastykakes. Now, she's helping to create them. After decades as a cop, John Wylie left law enforcement to become a yoga teacher. Check out the full We the People archive here.